Weight gain is commonly attributed to food intake. Yes, it is a fact that food can be the most common reason for weight to shoot up. But, it is not the ultimate truth in all cases. Despite the tremendous efforts you may be putting in on dieting and exercising for weight loss you are still gaining weight. This may well be due to some underlying health conditions or diseases. There are some common health conditions and diseases which are believed to be the reason for constant weight gain. Let’s now take a look at some of these common health conditions and the problems they cause to your weight loss efforts and your health in general. Thyroid hormone regulates the metabolism in both animals and humans. A deficiency of such hormone in the body would result to slowing down of the body’s metabolism. Although loss of appetite may be experienced, it is ironic there would still be a significant increase in body weight. Weight gain is brought about by fat deposits associated with fluid retention caused by protein deposits in the body that would, in return, increase the weight of a person. The most common notion and perception for food sensitivity would be allergic reactions following specific food intake. Food allergies do not just cause one to feel itchy and see remarkable physical allergic appearance. One of the effects that food sensitivity would cause would be weight gain. The effect of the allergen taken into the body may not be immediate. The reaction to which may take several minutes or even hours. An overt symptom would right away follow as manifested by swelling and bulging of the body. Weight gain may be observed right after the allergic attack. Cushing’s Syndrome is developed due to an overproduction of cortisol a hormone in the adrenal gland. This known health condition causes weight gain very quickly. Fluid retention in the tissues of the body causes this substantial weight gain. If you feel you may be suffering from Cushing’s Syndrome, professional collaborative support and treatment should be sought. A type of clinical depression which can affect women after childbirth. In some cases men, particularly new fathers, can also suffer from PPD. Research has shown that people who use prescription medicines everyday can gain large amounts of weight. Furthermore, research proved that prescription drugs increase the appetite of a person. In this case, possibility of weight gain is really to be considered. Oral contraceptives can also cause fluid to be retained in the body, resulting in bloating and an increase in weight can be experienced. A feeling of fear, worry, and uneasiness. People suffering from anxiety attacks may also experience an unpleasant feeling of inner turmoil. One of the major problems affecting weight loss and the inability to lose weight is an imbalance of sugar in the blood. Constant imbalance of blood sugar levels can lead to insulin resistance, causing permanent high blood sugar levels. Deficiency in fatty acids in the body would trigger one to crave for fatty foods. Since, the human body needs essential fatty acids for metabolic functions, insufficiency essential fatty acids will cause the body to compensate. Many health problems causing weight gain or inability to lose weight can be treated or controlled successfully, and, once treated, can result in gradual natural weight loss. The above article is for information only. 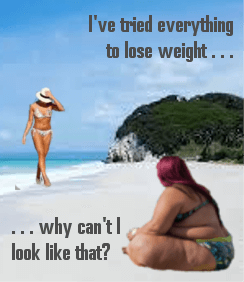 If you feel you have any underlying health problems causing weight gain or the inability to lose weight even if dieting for weight loss, please seek professional help.